XLSX is the Excel document created with the latest or higher versions of Microsoft Office Suite like 2007 and above. Corruption cases are common even in the later versions of Excel file which brings up the need of an XLSX repair software. One of the same categories with advanced facilities is our, XLSX Recovery Tool built with the finest set of algorithms. This program had been introduced especially to help resolve corruption issues encountered with 2007 and later version of Excel spreadsheet. Mostly, issues like malware intrusion, application malfunction, improper closure of the application, etc lead to integrity loss caused within spreadsheet and ending up as a severe case of corruption. Hence, in such circumstances trying to resolve the issue manually isn't an option due to the lack of availability of such a procedure. And using an external application like XLSX repair tool is highly recommended to avail a desirable and accurate outcome. A wide range of properties and facilities have been featured within the tool few of which have been listed for reference purpose. With the easy user interface offered under this application users can easily know how to open corrupt Excel file successfully post performing recovery. XLSX repair tool works for all types of corruption issues that may possibly damage your latest version of Excel spreadsheet. Once recovery has been performed on the respective spreadsheet, its contents are exported to a healthy XLSX file immediately after preview provided to the user. Preview of the spreadsheet contents is offered throughout the recovery offered by the XLSX file repair software program. The XLSX repair software comes in two versions each; Demo and Licensed edition. The demo version comes for free and offers a preview of the software functionality but doesn't let users save the repaired contents as a new file. 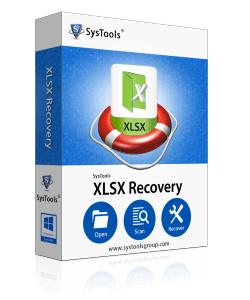 Meanwhile, purchasing the licensed version of XLSX Recovery application at a reasonable amount will permit you to perform limitless recovery of XLSX file and save it as a healthy file without any restrictions imposed.